Yep, that’s Keegan-Michael Key ’96g, with his Key & Peele co-star Jordan Peele, gracing the cover of Time‘s Ideas Issue, hitting newsstands now. To not make fun of something is, we believe, itself a form of bullying. When a humorist makes the conscious decision to exclude a group from derision, isn’t he or she implying that the members of that group are not capable of self-reflection? Or don’t possess the mental faculties to recognize the nuances of satire? A group that’s excluded never gets the opportunity to join in the greater human conversation. Entry filed under: Uncategorized. 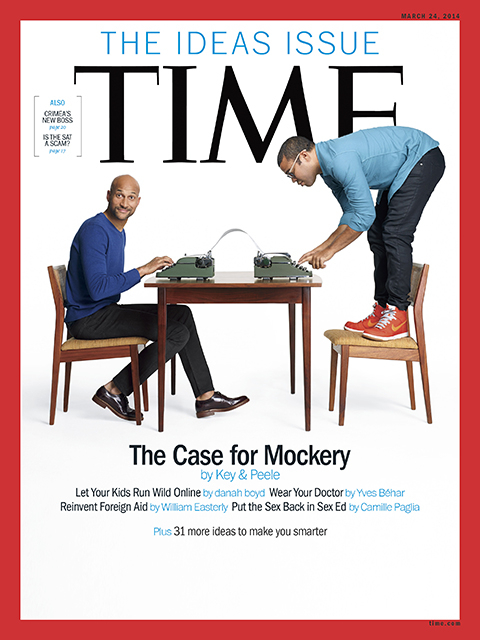 Tags: Jordan Peele, Keegan-Michael Key, Key & Peele, Time Magazine.